Image caption The study found red populations in the south of the country remained "under threat"
A call has been made for the battle to protect red squirrels to be "stepped up" as grey squirrels are reaching new parts of southern Scotland. Saving Scotland's Red Squirrels (SSRS) has just published the results of its 2018 annual survey. It showed that while most populations remained stable, those in the south of the country were still "under threat". SSRS is leading the fight to stop the spread of squirrelpox, which is carried by greys but is deadly only to reds. It has been monitoring populations across the country since 2011. It said last year's result made "optimistic reading" regarding the future of red squirrels in north east Scotland and the central Lowlands. However, in southern Scotland the proportion of survey sites detecting red squirrels had remained constant - but the number with a grey presence had "significantly increased". The organisation said it suggested grey squirrels were continuing to move into what had previously been "red only" territory. "Protecting red squirrels in south Scotland is challenging because grey squirrels are spreading south from the central belt and north from across the border," it said. "Grey squirrels also favour broadleaved trees such as oak and beech, which are more common in south Scotland's woodlands." The most positive survey results came from north east Scotland, where red squirrels continued to expand their range, particularly around Aberdeen. SSRS said it was "optimistic" greys could be completely removed from the area, which would eliminate a "major threat" to reds in Grampian and the Highlands. Project Manager Dr Mel Tonkin said: "Grey squirrels have continued to spread in some parts of southern Scotland, particularly in the eastern Borders and in the Nithsdale area of Dumfriesshire. "It is vital that the work we do in priority areas is stepped up to make sure that the red squirrel populations in these areas remain healthy." 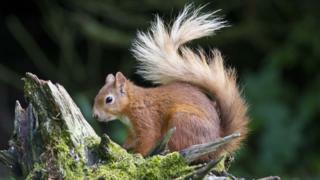 Dr Stephanie Johnstone, red squirrel conservation officer for south west Scotland, said that while the region faced "considerable challenges" it was still home to healthy red populations. "Fortunately there is a lot of community support for the work that we do, and local volunteers and landowners are playing a vital role in efforts to keep grey squirrel numbers low in target areas," she said. "In response to the increased threat of grey squirrels in the Nith Valley we are working with local landowners who are rallying to the cause to protect their red squirrels."